Akron Children’s Hospital is building a new $180 million critical care tower on this site. 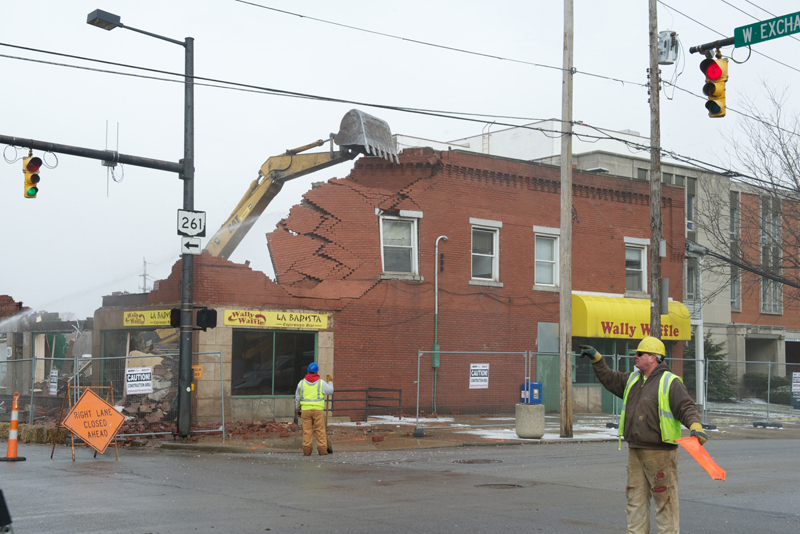 Workers from Ray Bertolini Trucking demolished the former Wally Waffle building at Locust and West Exchange streets March 2. It is the first of several buildings along Locust Street to be taken down in the upcoming weeks to make way for Akron Children’s new $200 million critical care tower. The tower will include a new emergency department, neonatal intensive care unit and outpatient surgical suites. Constructed circa 1913, the building served as the home of United Vacuum Cleaners for nearly 60 years. Other previous tenants included Meeker’s Kitchen, Brendan & Finn’s Irish Pub, and Ed Niam’s Parkette Restaurant. Wally Waffle has re-opened its restaurant in Akron’s Highland Square neighborhood.